25.03.11, Glasgow: Ian Macleod Distillers has teamed up withScotland’s biggest and best known music and events venue, the SECC in Glasgow. The unique deal sees Glengoyne Highland Single Malt and Smokehead Islay Single Malt enter a unique partnership to raise their profile to the 1.3 million visitors the SECC receives every year. Initiatives running throughout the year include samplings, incentives, competitions and promotions, online advertising (including ticketSOUP) and social media projects, as well as high impact banner advertising. The key objectives of the collaboration are to promote the whisky brands to visitors and highlight the local Glengoyne Distillery as a destination experience for the conference, exhibition and events markets. Following successful and on-going collaborations with iconic rock brands Marshall Amps and Classic Rock Magazine, Smokehead is continuing to grow its links to the rock world through sampling of ‘smoke and coke’ at a number of the SECC’s rock concerts. A specially designed and commissioned mobile bar made from Marshall’s Amps will be used to hand out the Smokehead samples. 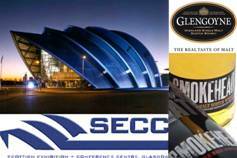 Glengoyne is now the official sponsor of the ‘Sounds Good’ VIP hospitality lounge at the SECC. Sampling of Glengoyne will also take place at a variety of music and comedy gigs, plus conferences and events, served at a special new bar created from Glengoyne whisky casks. Ian Macleod Distillers will be furthering this partnership by creating joint events for the corporate market including tours of nearby Glengoyne Distillery. The offering will also include working in partnership with the luxury Crowne Plaza hotel, next door to the SECC. Iain Weir, Marketing Director of Ian Macleod Distillers, brand owners of Smokehead and Glengoyne said: “It is a perfect partnership for our top quality Scottish brands to be linked with such an iconic Scottish venue. Fiona Crichton, Commercial Manager at SECC commented: “Having just launched our new Sounds Good VIP hospitality brand, this strategic relationship offers a fantastic platform for two distinct whisky brands to capitalise on the wonderful brand amplification opportunities that SECC offers”. The sponsorship kicked off in January with a competition in partnership with VisitScotland offering Smokehead customers the chance to win a 2 night break, gig tickets for the SECC, £300 spending money and of course a special bottle of Smokehead Whisky. Smokehead Whisky, the powerful Islay Single Malt which has become the drink of choice at rock events including High Voltage Festival and the Classic Rock Roll of Honour Awards, which took place at the Roundhouse in London last November. Smokehead is also a sponsor of the Marshall Ultimate Band Contest which was won last year by Surrey band ‘Sons of Icarus’ who have since signed with London management and released their first video.